I'm chugging along on the Sketchbook Project. The theme is 'Create and Capture' and I was stuck on it for quite a while. I kept coming up with different ideas and approaches but they were a little grander than the time (and my skills) allowed so I've decided to keep it simple. I'm interpreting the theme fairly literally and I'm drawing my art supplies - the things that I use to 'create' pictures and 'capture' my ideas. It's not the most original idea in the world but it allows me to sit quietly of an evening and draw what's in front of me and I find it's quite meditative and relaxing. I've decided to take out the original pages from the book and replace them with quality watercolour paper because it's a lot sturdier and can handle a lot more water without buckling (I don't want to send it off looking like I dropped it in the bath). The other advantage to pulling out the original pages is that I don't have to replace them with the same number. Is that cheating? I like to think of it as selective editing. 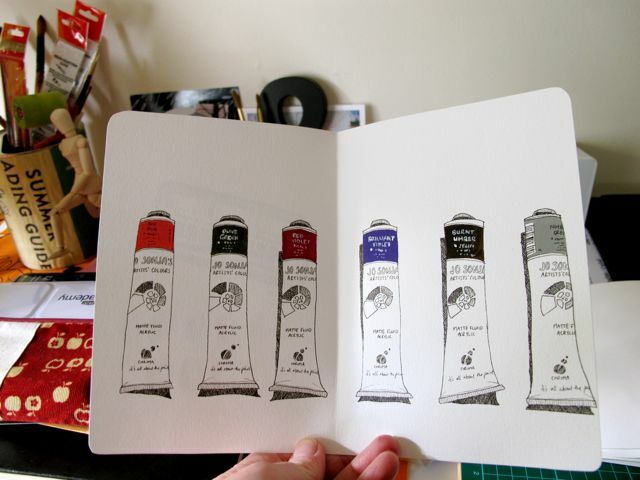 This is the middle page spread - fineliner outlines of my fave paints, Jo Sonjas, with the colour bands painted in acrylic. If anyone else reading this is doing this theme for the Sketchbook Project Limited Edition I would love to know your approach!